David Suna's connection with Yeshivat Har Etzion began when he was 8 days old. During his bechina with Harav Lichtenstein in 12th grade at MTA high school in NY, Harav Lichtenstein told him that he had attended his brit, since he was friendly with David's parents, Rav Yitzhak z"l and Hadassah, she'tibadel lechaim. David came to Yeshiva for the year in 1983 and studied Ketubot in Rav Ezra Bick's shiur. He recalls telling his cousins who were visiting from America on Sukkot that Israel was a nice place to visit but he wouldn't want to live there. By Pesach time, he had changed his mind and started to become interested in the idea of aliya. His two Israeli chevrutot – Gidi Sapir and Bentzy Rudell - probably contributed to this change of heart, and interestingly, today they both live in Alon Shevut where David lives with his wife, Susan, and their six children. Another strong influence was the frequent Friday tiyulim which were a positive experience, affording him a sense of connection to Jewish history, both biblical and modern. Other memories of Yeshiva include observing how Harav Lichtenstein shlit"a fulfilled the mitzvah of kibud av va'em with such devotion when he accompanied his elderly father during visits to Yeshiva. In addition, Harav Amital's chug on tefilla made a powerful impression on him. He clearly remembers Harav Amital's idea about kavana during davening. While many advise to move all thoughts out of your head before davening, Harav Amital stated bluntly, "That never works." Instead, he recommended channeling whatever issues are troubling you into the tefillot rather than pushing them away. David wanted to remain in Yeshiva for Shana Bet but made a deal with his parents that he could return after graduating college. He graduated YU in Computer Science and Math and returned for an additional year of study in 1986. That year was a different experience altogether. First, instead of being one of a group of 50 post-high school talmidim, he was one of four or five post-college guys. He studied Masechet Shabbat in Harav Lichtenstein's shiur and it was a productive year of learning. He felt that he really got to know the country by visiting many families in various communities. David returned to the States where he earned his Master's degree from NYU in Computer Science. In 1989, he married Susan Goldstein (whose sister Rachel is married to Rabbi Shalom Berger '83, resident historian on YHE trips to Poland) and the couple decided to adopt the five year plan for aliya (in fact, it turned out to be six years). Three of their children – Gavriel, Avigail and Refael were born in NY while Uriel, Michael and Yitzchak (named after his father z"l) are sabras. They lived in Har Nof for three years and moved to Alon Shevut in 1999. The Yeshiva was a central factor in their decision to live in Alon Shevut and greatly influences their daily lives. 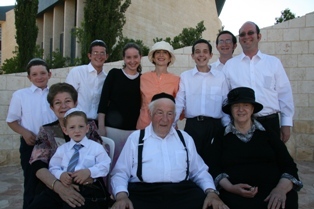 David tries to learn in the Beit Midrash at least twice a week and his children have had chevrutot with Har Etzion talmidim from an early age, who also came to their home for meals and attended family semachot. David hosted a bi-weekly Va'ad in his home for Shana Aleph talmidim where they were able to discuss various issues and establish a close connection with the family. One of the questions David posed at the start of the year, for example, was: "What are your goals for the year?" and "Would the goals be different if you were studying in a Yeshiva in America?" For the past 12 years, David has directed David's Consultants Internet Development - www.davidsconsultants.com – a company which develops websites and web programming for non-profit and private companies. David is a computer programmer with over 20 years experience who has recently specialized in building applications for the internet using the PHP language, as well as data bases and other advanced technology. One of his clients is Yeshivat Har Etzion, for whom he re-designed the website of the Virtual Beit Midrash and is currently re-building the Yeshiva's main website, with a JOOMLA based interface, enabling the Yeshiva's staff to update the site on their own. David attended the summer bar mitzvah program for bogrim at the Yeshiva with his son, Uriel, and is excited that his oldest son, Gavriel, is beginning the hesder program this year, learning with his cousin, Binyamin Berger. This is a natural development, given his family's close connection with Yeshiva, not to mention the fact that Gavriel has been learning in the Beit Midrash since second grade.